BEIJING (AP) -- Social media sites and blogs have lit up after eagle-eyed viewers spotted a surprise cameo in a Chinese TV documentary about the country's police force: Facebook founder Mark Zuckerberg and his now-wife, Priscilla Chan. The documentary by CCTV was part of a series on Chinese police and high-tech crime-solving methods. A few seconds of footage showing Zuckerberg and Chan walking behind two police officers were shown included in a brief clip posted online by the Hebei province satellite station. The footage shows the couple wearing the same clothes they were photographed in during a March 27 visit to Shanghai. Zuckerberg wears his custom hooded sweat shirt, this time in brown, and blue jeans, while Chan wears a printed short dress. The clip shows Zuckerberg looking at the back of the police officers and smiling broadly as the couple walks off-screen. 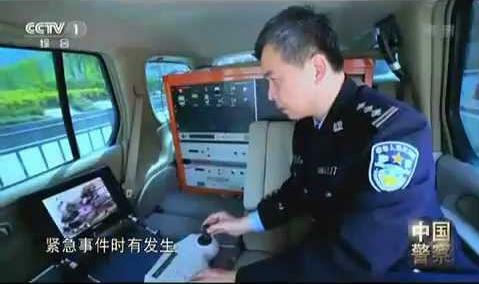 As they are shown, the narrator says: "There is a serious shortage in China's police manpower." It was not immediately known whether CCTV producers had knowingly inserted Zuckerberg into the documentary. Facebook is blocked in China, along with Twitter, YouTube and other foreign social media, a reflection of the leadership's fear that its power could be threatened by allowing citizens to organize outside of Communist Party control and enjoy unfettered access to information. Zuckerberg has visited China to vacation and to meet with high-tech entrepreneurs, including a 2010 lunch with Robin Li, CEO of leading Chinese search engine Baidu. He married the 27-year-old Chan on May 20 in a private ceremony at their home, during the same week that he turned 28 and stock for the social network site began trading publicly. A spokesman for Facebook, based in California, declined to comment Monday on the video clip. AP reporter Sudhin Thanawala contributed to this story from San Francisco.